ANN ARBOR, MI – Fresh off of the news that Alabama head coach Nick Saban had extended a scholarship offer to Florida eighth grader Jesus Machado, Jim Harbaugh of the University of Michigan immediately announced that he had reserved a roster spot on the 2035 Wolverines roster for the embryo of Robert and Pattie McCallister of Akron, Ohio. Harbaugh could not be reached for further comment, according to a University spokesperson, as he was en route to a Houston-area nursery to evaluate another crop of elite prospects. 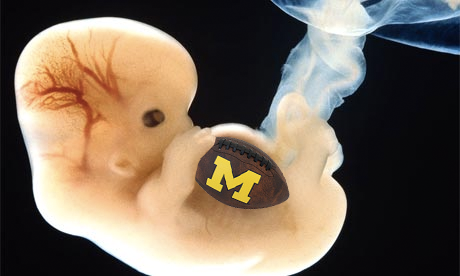 The zygote has until February 1, 2035 to sign a letter of intent and formally commit to the Wolverines.